The Outsider was an incomplete book. It was intended to document and order a subject which, for personal reasons, I find particularly absorbing: the subject of mental strain and near-insanity. Over many years, the obsessional figure whom I have called the Outsider became for me the heroic figure of our time. My vision of our civilisation was a vision of cheapness and futility, the degrading of all intellectual standards. In contrast to this, the Outsider seemed to be the man who, for any reason at all, felt himself lonely in the crowd of the second-rate. As I conceived him, he could be a maniac carrying a knife in a black bag, taking pride in appearing harmless and normal to other people; he could be a saint or a visionary, caring for nothing but one moment in which he seemed to understand the world, and see into the heart of nature and of God. The more I considered the Outsider, the more I felt him to be a symptom of our time and age. Essentially, he seemed to be a rebel; and what he was in rebellion against was the lack of spiritual tension in a materially prosperous civilisation. The first nine books of Saint Augustine’s Confessions are an Outsider document, and Saint Augustine lived in a disintegrating Roman society. It did not seem a bold step to conclude that the Outsider is a symptom of a civilisation’s decline; Outsiders appear like pimples on a dying civilisation. An individual tends to be what his environment makes him. If a civilisation is spiritually sick, the individual suffers from the same sickness. If he is healthy enough to put up a fight, he becomes an Outsider. The study of the spiritually sick individual belongs to psychology, but to consider him in relation to a sick civilisation is to enter the realm of history. That is why this book must attempt to pursue two courses at once, probing deeper into the Outsider himself, while at the same time moving towards the historical problem of the decline of civilisations. One way leads inward, towards mysticism; the other outward, towards politics. 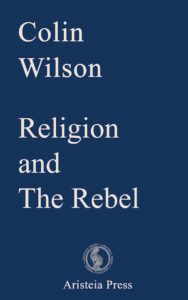 Unfortunately, I have almost no turn for practical politics, so the emphasis in this book is on religion and philosophy. Where the road disappears into the thickets of political theory, I leave it, and hope that someone less averse to politics than I am will press on where I have shirked the problem. Various critics have objected — with some justification — that the term ‘Outsider’ is loose; that a word which can be applied to Boehme as well as Nijinsky, to Fox and Gurdjieff as well as Lawrence, Van Gogh and Sartre, is almost meaningless. But my use of the term ‘Outsider’ is deliberately vague. The ultimate question that, for me, lies behind the Outsider is: How can man extend his range of consciousness? I believe that human beings experience a range of mental states which is as narrow as the middle three notes of a piano keyboard. I believe that the possible range of mental states is as wide as the whole piano keyboard, and that man’s sole aim and business is to extend his range from the usual three or four notes to the whole keyboard. The men I dealt with in The Outsider had one thing in common: an instinctive knowledge that their range could be extended, and a nagging dissatisfaction with the range of their everyday experience. This, I must admit, is the urge that underlies all my thinking and writing. I state it here so that there shall be no doubt in any reader’s mind about the central preoccupation of my book. The publication of The Outsider brought me some interesting insights. It received more attention than I or my publisher had expected, and, quite suddenly, I became involved in all kinds of activities. For many months after it was published, I had almost no time alone, caught up as I was in a round of interviews by reporters, lectures, broadcasts, reading and answering letters, invitations to dinner, and so on. The result was exactly what I had been afraid of: I found myself losing the preoccupations that had led me to write The Outsider. Strangers who claimed to be Outsiders wrote me long letters explaining their symptoms and asking for advice, until I began to suspect parody. In this whirl, I discovered that I ceased to be aware of the states of consciousness that lie beyond my ordinary two or three notes. In my own terminology, I had started to become an Insider. I record this because it is of central importance to the theme of this book. Most men I know live like this as a matter of course: working, travelling, eating and drinking and talking. The range of everyday activity in a modern civilisation builds a wall around the ordinary state of consciousness and makes it almost impossible to see beyond it. The conditions under which we live do this to us. It is what happens in a civilisation that always makes a noise like a dynamo, and gives no leisure for peace and contemplation. Men begin to lose that intuition of ‘unknown modes of being,’ that sense of purpose, that makes them more than highly efficient pigs. This is the horror the Outsider revolts against. Some years ago, in Winchester Cathedral, I came across a pamphlet by Mr. T. S. Eliot; it was an address which Mr. Eliot had delivered in the Cathedral, and it had the unpromising title: ‘On the Use of Cathedrals in England.’ For three quarters of the pamphlet, Mr. Eliot talks like a studious country parson about the relation of the cathedral to the parish churches. And then, towards the end, he speaks of the position of the dean and chapter, and his pamphlet suddenly becomes an impassioned plea for leisure in a modern civilisation. He attacks the view that the dean and chapter should be general runabouts, preaching sermons all over the parish, and emphasises that good theological thinking requires quiet and contemplation. He adduces his own example to strengthen his point: he has always worked as a publisher to give himself the necessary leisure for writing, and any permanent value which his work may possess (he modestly claims) is due to the fact that he wrote only what he wanted to write, under no compulsion to please anyone but himself. For my own part, I found that I preferred working as a navvy or washing dishes to life in an office; for although I had no more than the normal reluctance to face hard work, I had a very real fear of that deadening of the nerves and sensibilities that comes of boredom and submitting to one’s own self-contempt. I was sticking down envelopes with a damp brush one afternoon, when a young man who seemed to enjoy being a civil servant commented: ‘Soul-destroying, isn’t it?’ A commonplace phrase, but I had never heard it before, and I repeated it like a revelation. Not soul-destroying, but life-destroying; the stagnating life-force gives off smells like standing water, and the whole being is poisoned. Desmond — that was his name — always looked well groomed and efficient, and I never saw him lose his temper. My own predisposition to boredom and irritable wretchedness inclined me to divide the world into two classes: people who disliked themselves, and people who didn’t. And the former disliked the latter even more than they disliked themselves. Such experiences were the groundwork of all my analyses, my starting point; and all my thought aimed at discovering some solution that would enable the people who disliked themselves to find reasons — or methods — of overcoming self-contempt, without numbing themselves into complacency. I called the people who disliked themselves Outsiders. Boredom, I knew, meant not having enough to do with one’s life energies. The answer to it, quite simply, lies in extending the range of the consciousness: setting emotions circulating, and setting the intellect working, until new areas of consciousness are brought to life in the way that the blood starts flowing again through a leg which has gone numb. That was just the starting point. It is not enough to have leisure; leisure is only a negative concept, the wide, clear space where one can build decent houses after knocking down slums. The next problem is to begin to build. I found it tiresome to work for an employer in a factory or laundry, and envied those men who can make a living by doing the things they enjoy. But closer acquaintance with such men — writers, artists, journalists — has usually proved to me that they have knocked down one slum only to build another — slightly more to their own taste, but still a slum. From the point of view of spiritual health, I do not think there is much to choose between the workman who has worked in the same factory for forty years and is spiritually warped and stunted in consequence, and the novelist who writes the same kind of novels for forty years and has a house on the Riviera. It is unnatural to work for forty years in the same factory, but no more unnatural than it is to be born. Nature is dead; every act of will is unnatural, against nature. The more one has to fight against, the more alive one can be. That was why, for me, the problem of living resolved itself into the question of choosing obstacles to stimulate my will. Instantly, I came to recognise that our civilisation is flowing in the opposite direction; all our culture and science is directed towards enabling us to exercise as little will as possible. Everything is made easy; and if, after a week of office routine and travelling on buses, we still feel the need to work off excess energy, we can always enjoy ourselves playing all those games involving artificial obstacles, where the will is applied to beating another team of cricketers or footballers, or simply to wrestling with the imaginary Sphinx who sets the newspaper crossword puzzles. We have also invented a form of thought that fits in with this abdication of the will. We call it abstract philosophy. It is essentially the product of Western civilisation. There was an element of disguised autobiography in The Outsider; obviously, since I spent most of the book calling on other men to bear witness to my own beliefs. Underlying the whole argument there was the belief that real philosophy should be the result of applying the analytical faculty — the mathematical faculty — to the stuff of one’s own experience. Too much experience flows over us like water through a channel: it means nothing to us; we are unchanged by it, unconscious of it. For years before I wrote The Outsider I had kept a journal in which I had been mainly concerned with applying mathematical analysis to my own experience, and making a note when I read something that showed the same preoccupation. There was a slow, deliberate accumulation of material that I was able to transfer almost unchanged into the book. That material was chosen — naturally — to exclude myself.